Is chronic pain holding you back from fully living your life? Get more out of life with the proper support and the latest in chiropractic care from Rosenthal Chiropractic Clinic. Feel good and be able to do more! Your spine and your brain keep the systems in your body running properly – if your spine is out of balance, you may be experiencing chronic pain, tiredness or illness. Regular methods of pain relief like anti-inflammatory drugs, physical therapy, and surgery are limited in their success because they generally treat the patient’s symptoms, not the source of the problem. Medicine alters body function. Chiropractic restores body function. At Rosenthal Chiropractic Clinic, we treat your body as a whole and believe that when your spine is in alignment and supported correctly, you will achieve better health and quality of life. When you visit us, we will help you develop a plan for better health so that you can leave your pain in the past and find the quality of life you deserve. Dr. Marcy recommends Serola Sacroiliac Belts for our patients’ comfort and we carry them for our patients’ convenience. Years of research based on biomechanics have gone into the design of these belts, made especially to stabilize the sacroiliac joint, thus providing pain relief while preventing further injury. The sacroiliac joint has been determined to be the major biomechanical cause of low back pain. The Serola belt serves to normalize the function of the joint, and can be worn for extended periods without causing muscle weakness or atrophy. Normalizing sacroiliac joint function allows for proper healing. You can even exercise while wearing the sacroiliac belt. If you have low back pain, Dr. Marcy may recommend the benefits of a sacroiliac belt to you. Did you know that prolonged sitting can cause lower back pain and injury? Research has shown that sitting is bad for you, yet we all have to sit. For a completely portable solution to reducing back pain and improving your sitting posture, try the Back Vitalizer! Of users who have tried it, 97 out of 100 people recommend it! 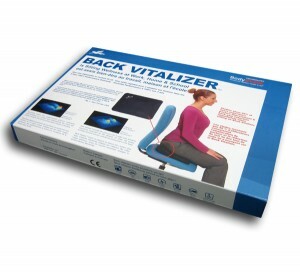 The Back Vitalizer is a light-weight cushion that you use to sit on or rest your back against. YOU decide which location helps you the most. This special inflatable cushion provides custom lumbar support, is a spinal decompression device, a functional balance trainer and a cervical pillow. For convenience, we carry them right here in the office. Whether you are sitting in a car, truck, office chair, airplane, wheelchair, or simply relaxing at home, the Back Vitalizer has been shown to reduce or prevent pain, stiffness or fatigue in your lower back, neck and/or shoulders. Visit the company’s website to read more about this remarkable device that is sold in 20 countries. Each of our patients who use one, swear by it! Ask Dr. Marcy about getting your own Back Vitalizer!